Autocar report that a new Bugatti Veyron is currently undergoing initial conceptual engineering tests in a programme aimed at unveiling the car in 2016 prior to a planned start to customer deliveries the following year. According to sources close to Bugatti, early test mules for the new car exist and have already been pressed into action in an early round of testing. Following recent arrivals such as the McLaren P1, Porsche 918 Spyder and LaFerrari, the new Bugatti will feature a battery powered hybrid electric powertrain. The same quad-turbocharged 8.0-litre W16 powerplant as its predecessor will be retained but with the possible addition of electric turbochargers, perhaps along the lines of those used by Porsche in LMP1 (Porsche and Bugatti are both part of the VW group) and the 2014 Formula One ERS MGU-H (where the H stands for heat). The big news centres around plans to provide the new Bugatti with hybrid drive by way of a disc-shaped Axial Flux electric motor mounted within the gearbox housing. Together, the petrol engine and electric motor are said to deliver up to 1500 hp. By comparison, the Veyron Super Sport has 1183 hp. Autocar sources suggest that torque will be capped at 1500 Nm for the sake of gearbox reliability. 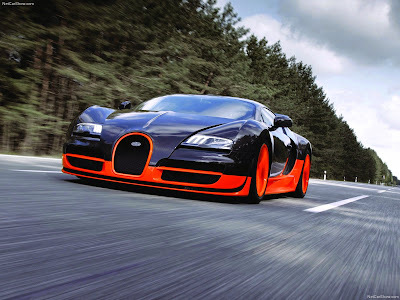 A Veyron Super Sport already has 1500 Nm from 3000 to 5000 rpm. With an Axial Flux AC Induction motor able to generate almost as much torque (1250 Nm from the EE in-wheel motor) The Bugatti hybrid electric powertrain design looks likely to be a very conservative step with it's full potential limited by the fragility of a mechanical driveline. The new hybrid Veyron should have some fairly startling performance in electric only mode (if it has one - see LaFerrari), but in parallel mode, other than providing torque fill below 3,000 rpm, (partly explaining why Bugatti expect 0-100 km/h times to drop to 2.3 sec) the full potential of the hybrid powerplant will be restricted by a mechanical transmission layout that may not move on much from the current Veyron. As with the McLaren P1, a hybrid with an ICE that still idles in traffic, or the LaFerrari which has no pure EV mode, the new Bugatti may succeed in combining the superior low rpm torque characteristics of an electric motor to give the instant throttle response and acceleration of an EV, what McLaren call 'torque fill', with the enormous top end torque of a large displacement forced induction ICE, but in common with the aforementioned hybrid hypercars, it may be very much a first generation 'mild' hybrid. As Bugatti are testing five prototypes with differing powertrain combinations perhaps there are some surprises still in store. With an expected sales date in 2017 the new Veyron should be much father down the road technically than either the McLaren of LeFerrari. The current cutting edge is represented by the Mercedes SLS E-Drive with it's wheel motor powertrain allowing full blown dynamic torque vectoring to amazing effect. In fact it was a Mitsubishi developed AWD wheel motor powertrain with S-AWC (Mitsubishi branding for 'torque vectoring') that recently re-set the record books at Pikes Peak finishing 2nd and 3rd outright with only one ICE powered car preventing an EV clean sweep in 2014. Is it too much to hope for a Bugatti with torque vectoring or will we have to wait for future evolutions of hybrid supercar powertrain design before we see anything truly revolutionary.